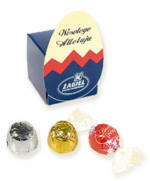 Small egg box with logo from Calendar Lady Promotions are 2 filled chocolates or 1 luxury milk LINDOR LINDT Praline. Size: 40mm x 50mm x 73mm. Milk LINDOR LINDT praline with smooth chocolate filling. So advertise your details upon our Small egg box with logo today!!! Colours: 1-4 colours Delivery time: 2-3 weeks as standard, please advise if needed sooner. Other promotional and personalised items besides our Small egg box with logo click here. To find out more about our Small egg box with logo click here and fill in the contact form and we'll get straight back to you.